Flying cars may seem like something reserved only for science fiction movies, but a tech start up backed by Google co-founder Larry Page has just taken a huge step to making the futuristic mode of transport a reality. Last week, company Kitty Hawk unveiled the latest version of its flying car called the Flyer. 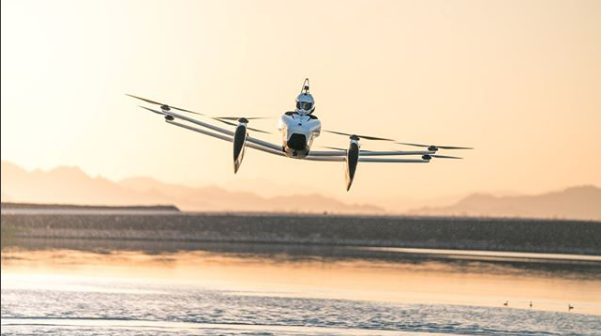 When the aircraft was first unveiled in 2017, it was an open seated flying contraption weighing around 200 pounds and powered by eight battery powered propellers. But after somewhat of a design overhaul the new version is sleeker, with it now looking more like a drone and comes with two additional propellers, increasing the overall weight to 250 pounds. It can fly up to 10 feet and has a top speed of 20mph – which are both limited by the onboard flight control system for people who are flying the vehicle for the first time. According to Kitty Hawk, the one seater Flyer has been “designed to be easy to fly and flown for recreational purposes over water and uncongested areas”. The firm says would be pilots need just two hours of training in order to be able to operate the Flyer. Following its unveiling last week, popular YouTuber Casey Neistat was invited by Kitty Hawk to give the Flyer a test flight. Casey Neistat, who has more than 9.5 million subscribers to his YouTube channel said the Flyer was “amazing”, adding “if this thing didn’t have these limiters on it, I would have taken it up to 500 feet”. The Flyer is currently classified in the United States as an ultralight aircraft meaning no special license is required to fly it. The company hasn’t revealed when the Flyer will go on sale. Earlier this year, Kitty Hawk was granted approval from the New Zealand government to test autonomous flying taxis.